Favorable growth of organic agricultural practices all over the world coupled with regional government initiatives to promote organic farming is bolstering growth of global organic fertilizers market. According to Research Institute of Organic Agriculture (FiBL) report, in 2015, over 50.9 million hectares of land is occupied by organic agricultural activities. The regions with the largest areas of organic agricultural land are Oceania (22.8 million hectares, which is almost 45% of the world’s organic agricultural land) and Europe (12.7 million hectares, 25 %). The countries with the most organic agricultural land are Australia (22.7 million hectares), Argentina (3.1 million hectares), and the U.S (2 million hectares). Increasing inclination of consumers towards organic food products is propelling demand for organic fertilizers in organic farming. According to reports published by the Food and Drug Administration of United States, 6 out of 10 people in U.S. believe that organic foods are better for their health. Also, according to the U.S Department of Agriculture, in 2016, around 4% of total food sales in the U.S. were accounted by organic products. The organic retail sales in Europe were accounted for US$ 30.85 billion in 2014, as estimated by The International Federation of Organic Agriculture Movements. Therefore, favorable growth of organic food and beverage industry fuelled by increasing demand for organic food and beverage products provides an immense opportunity for organic fertilizers market growth. According to Research Institute of Organic Agriculture (FiBL) report, total organic product sales was US$ 43.3 billion by the end of 2015, up 11 percent from the 2014 record level and according to the Organic Trade Association the overall food market’s growth rate of 3%. Of the US$ 43.3 in total organic sales, US$ 39.7 were organic food sales. Among functionality, nitrogen fixing segment generated highest revenue in global organic fertilizers market in 2016. 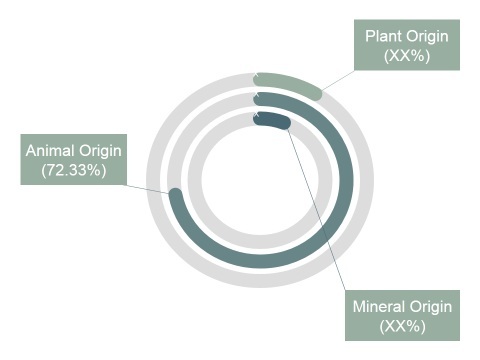 The segment is projected to lead the market over the forecast period due to increasing demand for organic fertilizers in order to improve productivity and sustainability of soil with the help of nitrogen fixation process. Europe held largest market share in global organic fertilizers market in 2016 and the region is projected to maintain its dominance throughout the forecast period. In Europe, U.K., Germany Spain, Italy are the most lucrative markets for organic fertilizers. According to Research Institute of Organic Agriculture (FIBL), the total area under organic production in Europe increased from 0.1 million hectares in 1985 to 13 million hectares in 2015. This can be attributed to an increased demand for organic food and beverages in the region. According to Coherent Market Insights analysis, organic fertilizers market was valued at US$ 6.15 Bn in 2016 and is expected to reach US$ 12.26 Bn by 2025 at a CAGR of 8.27% over the forecast period. Among source, highest revenue share of 72.33% was exhibited by animal origin segment in the global organic fertilizers market in 2016. This was attributed to advantages of animal-based organic fertilizers such as presence of high amount of macro-nutrients and less degradation time over others organic fertilizers. The major players operating in the global organic fertilizers market include Tata Chemicals Ltd, Midwestern BioAg, Purely Organic Products, LLC, BioSTAR Organics, Multiplex Group, Italpollina S.p.A, National Fertilizers Ltd., and Sustane Natural Fertilizer, Inc.
Key players are strategically investing in the organic fertilizers market, to enhance their production capacity through smart business strategies. For instance, in April 2017, the Multiplex Group established a new manufacturing unit at India to meet increasing demand for micronutrients, specialty fertilizers, soil conditioners, bio pesticides, and bio fertilizers. Organic fertilizers are made up of natural and easily biodegradable material such as plant residues and animal waste. Therefore, there is very less possibility of toxic build-up after degradation. In contrast with chemical fertilizers, organic fertilizers balance soil pH and improve soil fertility. Such advantages of organic fertilizers over chemical fertilizers are projected to fuel demand for organic fertilizers throughout the forecast period. The growth of global organic fertilizers market is mainly driven by growing demand for organic fertilizers due to its multiple benefits such as less toxic build up, improving soil fertility and various others. Among Application, soil treatment segment, held highest revenue share in global organic fertilizers market in 2016. Owing to increasing demand for organic fertilizers to change soil fertility, the trend is projected to be continued over the forecast period. Europe dominated in global organic fertilizers market in 2016 and the region is projected to maintain its dominance over the forecast period. Increasing organic farming practices and bulk availability of organic fertilizers sources such as minerals, plants in the region are some of the key factors, driving growth of Europe organic fertilizers market. Asia Pacific is projected to be the fastest growing region throughout the forecast period. Key companies covered as a part of this study includes Tata Chemicals Ltd, Midwestern BioAg, Purely Organic Products, LLC, BioSTAR Organics, Multiplex Group, Italpollina S.p.A, National Fertilizers Ltd., Sustane Natural Fertilizer, Inc. among others. *Browse 150 market data tables and 60 figures on "Organic Fertilizers Market - Global forecast to 2025”.